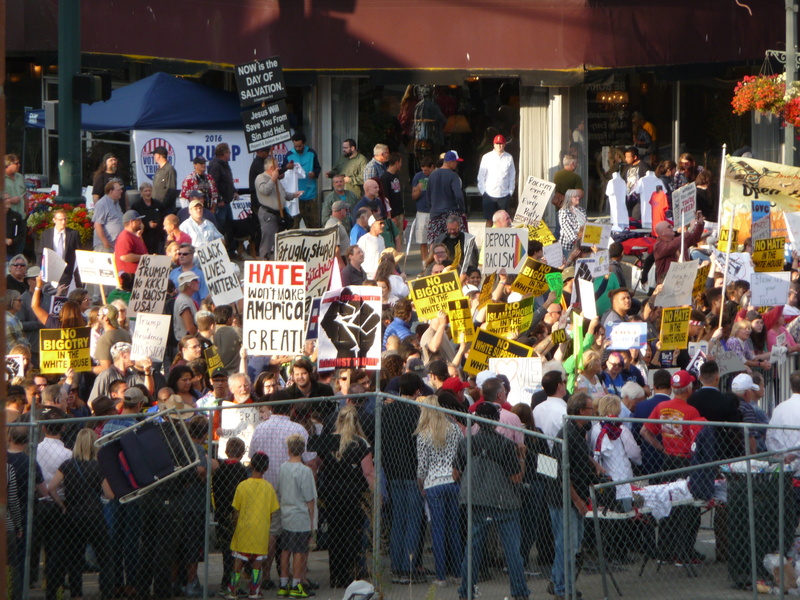 Protesters confront Trump supporters outside the Comcast arena. Donald Trump came back to the site of one of his granddaddy Friedrich’s first “hotels” yesterday for a rally at Comcast arena in Everett, Washington. Friedrich sold his restaurant/bordello [the Dairy in Seattle] and set up a new business about thirty miles north. Rumor had it that the oil-rich Rockefellers planned a big mining operation in the area. On a piece of land he didn’t own, right across from the train station, Friedrich built a hotel of sorts ~ one intended mostly for, shall we say, active short stays, not overnight visits. In other words, it was another bordello. 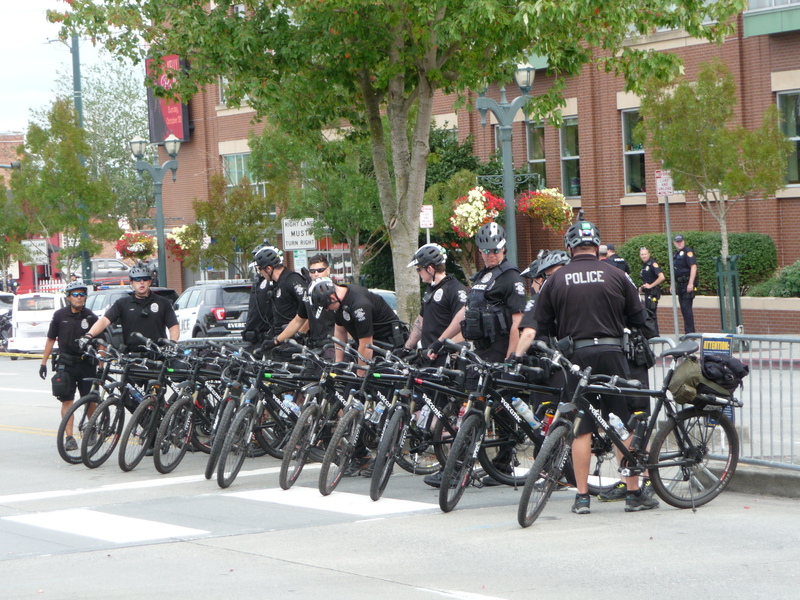 A cadre of bicycle cops were waiting for protesters to arrive from Clark Park. Clearly, the cops were expecting trouble which didn’t happen. There must have been 200 cops, and I wonder who paid for all that overtime. 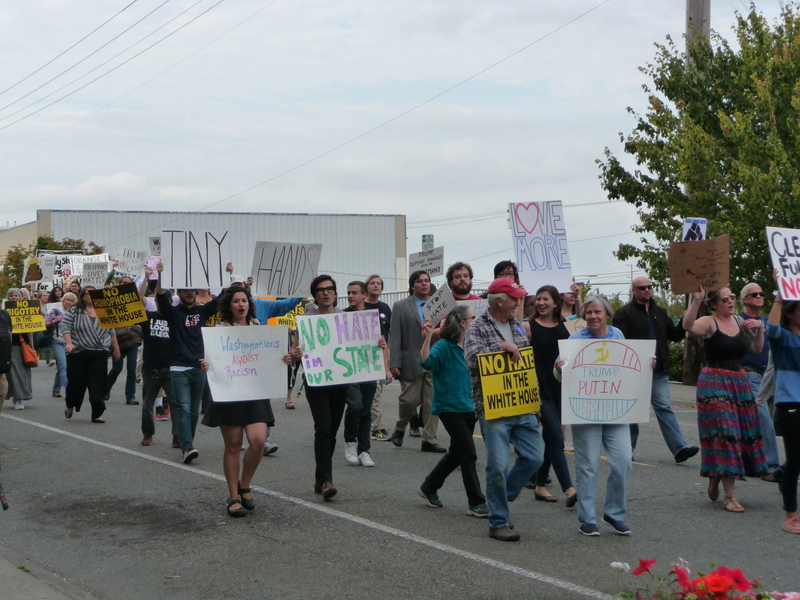 Protesters arriving from Clark Park at the Comcast arena. Most of the protest signs called for love to trump hate and for an end to racism and bigotry. 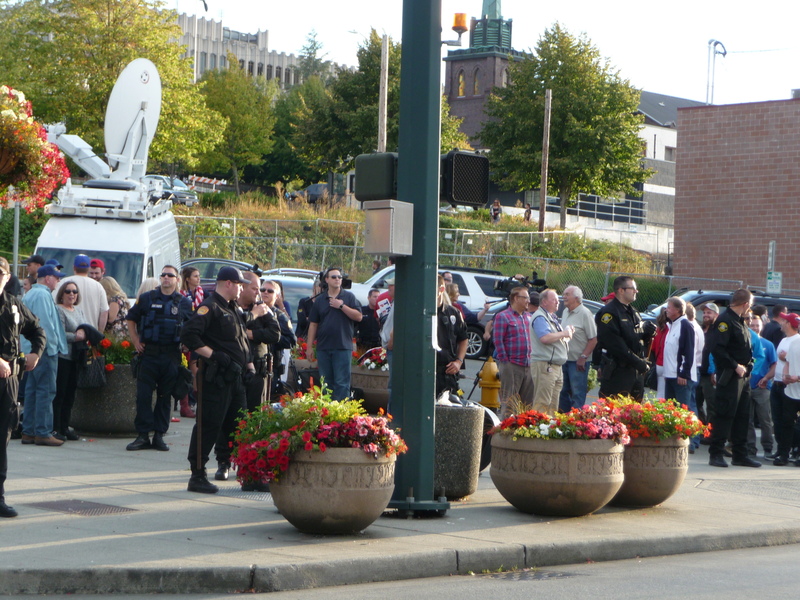 Trump supporters waiting to enter the rally. The first supporters arrived at 2:00 AM, and the line was 10 blocks long. I was disappointed and astonished to read that Trump got more votes than Hillary Clinton in the county where I live during the primary election. Clearly, I have far more bigoted, racist Archie Bunker neighbors that I knew or suspected. 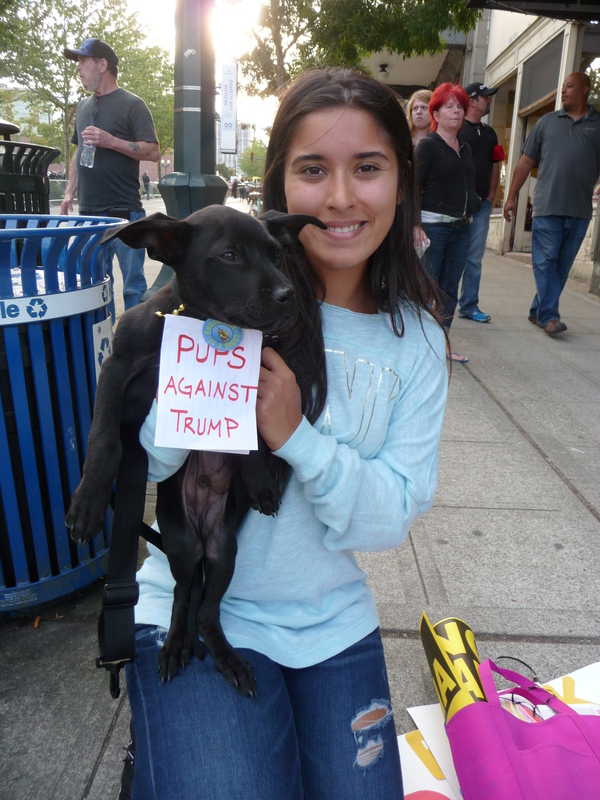 My favorite protester was this darling pup against Trump. 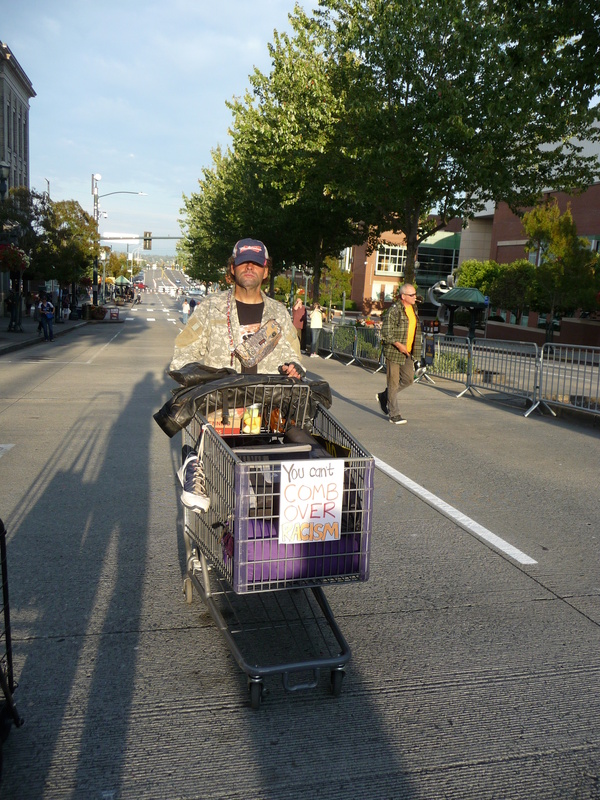 The sign on this homeless guy’s cart was quite clever. He asked me to post his photo on the Internet, and I hope he gets to see that I did. 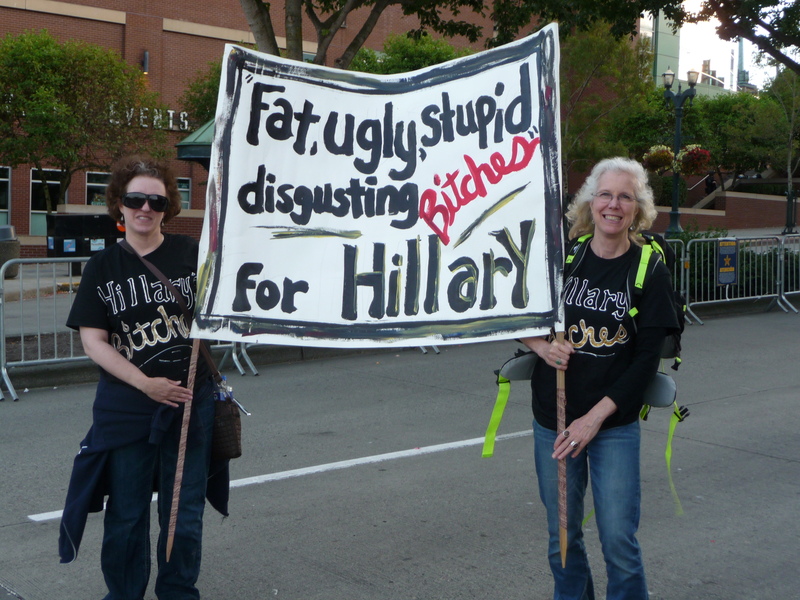 This sign made me laugh because these lovely ladies are obviously not fat, ugly, stupid, or disgusting. Of course, that’s how Donald Trump sees us. And, that’s a huge reason he won’t be getting my vote. It appears he may have abused his second wife Marla Maples, and he has proudly declared that he lusts after his daughter Ivanka. I’ll share the other reasons I’m not voting for Trump when I review The Making of Donald Trump.